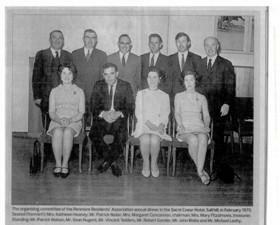 The Renmore Residents Association was established in 1959 and later merged in the early 1960’s with the Renmore Park Residents Association to form the enlarged association that still exists today. From its earliest beginnings the association formed a strong bond with the local authorities that existed in Galway and put in place the foundation of a good working relationship. Down through the decades this arrangement has yielded many worthwhile and tangible benefits to the area. Equally Galway City Council has also benefited from this worthwhile symbiosis, in that it has launched some major initiatives, choosing Renmore as a pilot site. This was best demonstrated when the association, with considerable assistance from the City Council, launched an anti-litter campaign in the 1990’s. When Galway City Council was considering launching its new re-cycling project, it approached Renmore Residents Association with a view to selecting Renmore as a pilot site. Once again the Association embraced the initiative and successfully introduced the concept in Renmore which was later extended throughout the city. From the earliest days the association has also supported the Tidy Town competitions and because of its continued involvement has secured many prestigious prizes for the area including twice taking the overall Tidiest District in Ireland Award. Most recently Renmore won the Pride of Place competition. The award was presented to Norbert Sheerin representing the Renmore Residents Association along with Cllr. Padraic Conneely, Mayor of Galway and Mary O’Leary of Galway City Council by President of Ireland Mary McAleese at a glittering ceremony in Waterford on 8th November 2008. The Renmore Residents Association was delighted to receive the award and it was a proud day for the area and its people and is tangible evidence of the dedicated work that goes into making an area and a community work together. In as much as the earliest committees of the Association had to possess vision, with a sense of reality, so also the committee of today must bring new sets of skills in order for the Association to prosper. The fact that today’s committee operates with a sense of commitment and vision is the result of high standards established by those who have gone before.